Fight webpack bundle bloat by tracking the effect of every commit. Catch it before your users do. It is well researched that every second counts when it comes to customer conversion and satisfaction. The speed of your application has the potential to delight or frustrate. Google estimates that 70% of cellular network connections globally will occur at 3G speeds or slower through 2020. People that see your application as slow will not stick around. Webpack and the npm registry form a powerful combination for front end development. But, when left unchecked, this power can result in oversized assets, package overuse, and redundant chunk contents. All while producing a turbulent browser cache that ends up slowing down your delivery. You won't improve what you don't measure. 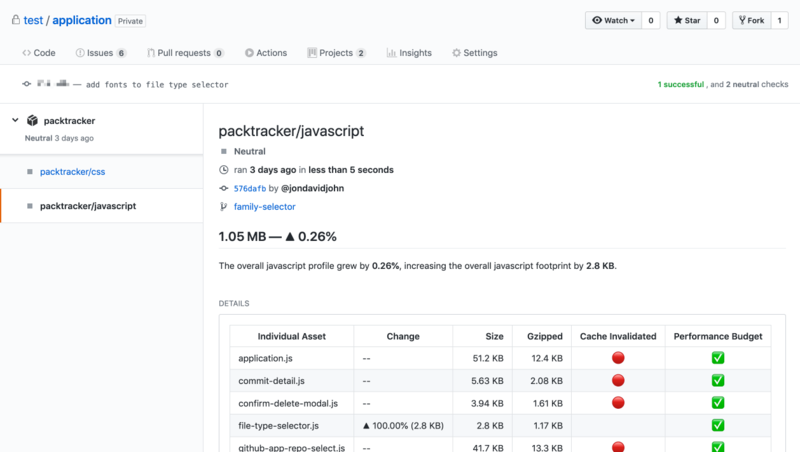 We provide a tool to automatically analyze your webpack output for every commit. We'll track your bundle size, how often they invalidate the browser's cache, and allow you to dig deeper into the makeup of any individual webpack asset. You can leverage this analysis to fine tune your application asset profile. Find bundle bloat, reduce repetition between chunks, and improve your caching strategies. What good is one time analysis and optimization? We've also created a GitHub App that uses pull request checks so that you will get your bundle analysis in every pull request before it hits your users. Make webpack bundle analysis a first class concern of your process. "packtracker.io has quickly become an indispensable part of our performance analysis toolset." Process unlimited commits for all your non-commercial public projects at no charge. Get started for free with a 14 day free trial. Reach out to sales@packtracker.io for more custom options if you have heavier usage patterns. Hear about our latest features and product announcements.